An extrication collar promotes neutral spine alignment for a patient during transportation. Our extrication collar comes completely flat and is easy to store. Can also be used to help relieve pain associated with whip lash or neck and back muscle injuries. However, would not recommend wearing this collar for long periods of time because it may mask symptoms of a more serious problem. HSE guidance clearly states employers have a legal duty of care towards their employees. This includes arranging equipment to ensure their employees receive immediate attention if an injury occurs at work. 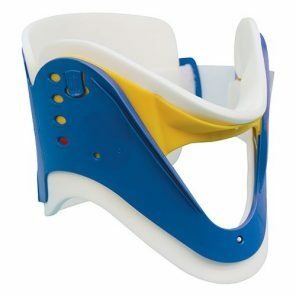 If your assessment of needs suggests your work place is a risk to causing head, neck and spinal injuries, it certainly may be wise to consider supplying a cervical collar for such events. To view our full range of stretchers and emergency evacuation equipment please click here.